Lambda Legal and OutServe-SLDN, LGBTQ military advocacy groups, are suing the Defense Department over what they say is its “outdated” and “unconstitutional” policies involving HIV-positive service members. “For over 30 years, the military has placed broad restrictions on the service of people living with HIV," says the lawsuit, filed Wednesday in U.S. District Court for the Eastern District of Virginia. "Military regulations prohibit the enlistment or commissioning of any individual living with HIV and place strict geographic limitations on the service of members who first test HIV positive while on active duty." The Pentagon adopted a strict HIV policy in 1991, when AIDS was the No. 2 killer of men aged 25 to 44 in the U.S. The policy has been revised since, but not enough, according to Scott A. Schoettes, director of the HIV Project at Lambda Legal, which filed the suit on behalf of Nicholas Harrison, a sergeant in the District of Columbia Army National Guard who was denied an officer position. “This is an instance of discrimination that has been longstanding, and it was finally time to make clear that we weren’t going to stand for this type of discrimination by our own government,” Schoettes told NBC News. While the Defense Department declined to comment on the lawsuit, a spokeswoman said in an email to NBC News that active-duty service members with HIV are “evaluated and managed in the same manner as a service member with other chronic or progressive illnesses.” She also said the department's HIV policies "are evidence-based, medically accurate, and are reviewed regularly and updated." Harrison, 41, joined the military when he was 23 and has served two tours of duty in the Middle East. He diagnosed with HIV in 2012, around the same time he passed the bar exam. 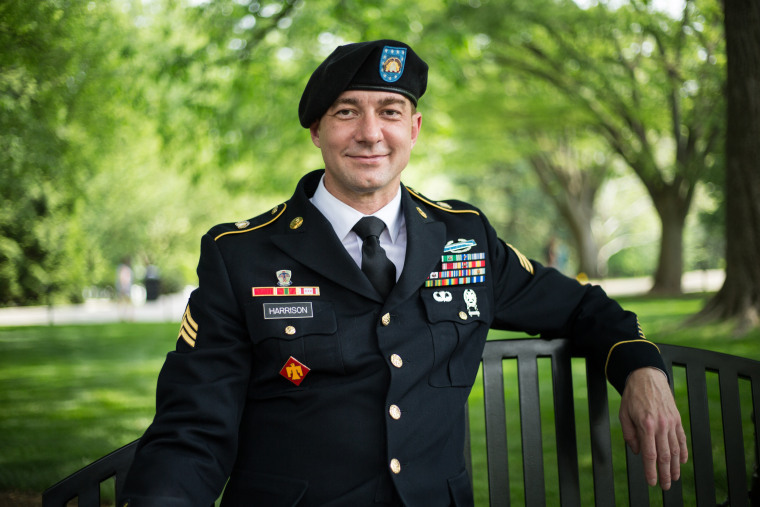 Harrison was confronted with the military’s HIV policy a few years later, when he was denied an officer position in the Judge Advocate General Corps, the division of the military that handles legal matters. “Decisions are being made about HIV that have nothing to do with the current state of science,” Halkitis told NBC News. Harrison's lawsuit, which lists the Defense Department, Defense Secretary Jim Mattis and Army Secretary Mark Esper as defendants, seeks to have the Pentagon lift restrictions placed on service members because of their HIV status and commission Harrison as a JAG officer for the D.C. National Guard. Alamin Yohannes and Tim Fitzsimons contributed.